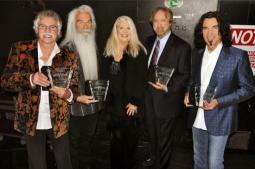 The Oak Ridge Boys added two more awards to their list of acolades. Judy Nelon presented the guys with The President's Honor Award from the Southern Gospel Music Guild on Monday, April 19. It is the highest award given by the SGMG. A few nights later the Oaks won another Dove award for "Best Long Form Video Of The Year." This is the ninth Dove Award during their career. "Just when you least expect it." said Golden. "I am so honored and surprised." The Oak Ridge Boys were honored Wednesday night, April 21, at the 41st Annual GMA Dove Awards show held at the Opry House in Nashville. The group's Country-Gospel documentary-performance, A Gospel Journey, took home the Long Form Music Video of the Year award. The video was directed by Doug Stuckey and produced by Bill Gaither, Barry Jennings, and Bill Carter for Gaither Television Productions/Gaither Music Group. This is the Oaks' ninth Dove in a career that has spanned thirty years, most of those in Country music, where the group has been bestowed with more than fifty awards, including the CMA and ACM Vocal Group of the Year and Song of the Year, as well as a Grammy for their multi-platinum single, Elvira.